When launching iCash you will be shown with a Recent Documents window from where you can open previous documents or create new ones. If it is the first time you are using iCash, just hit the New button in order to create a new document. Note that iCash documents contain everything you need to start managing your money so you will likely use one document only. This document can be opened directly from the Finder with a double-click. Doing so you will not see the 'Recent Documents' window below. If you choose to create a whole new document you will be asked to enter a name. This name will identify your document file and will be also the document title. 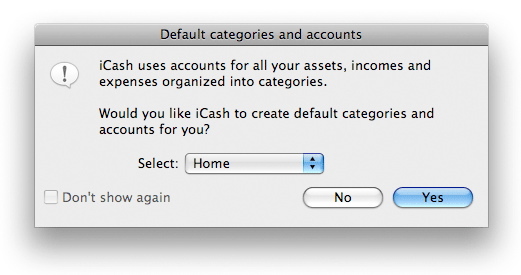 Once a name has been given you will be asked whether you want iCash to create default categories and accounts for you. You have the choice between two account sets labeled Home and Office. iCash uses accounts for everything from Banks to expenses allowing the user to get individual balances at any time, generate customized reports and track every single money matter. All those accounts are arranged into categories and types. Of course you can choose to create them yourself but it is recommended you first create a document using a predefined set to understand how iCash works. Home set includes 34 accounts and 38 categories for home use. Office set includes 73 accounts and 32 categories for the office. Note: You can also create a new document importing accounts and categories from previous iCash file. Just select iCash file from the pull-down menu and check the 'Copy Balances' box if you want to copy balances. The file creation process can take anywhere from a few seconds to a couple of minutes depending on your machine speed. When Overview, Queries, Reports and Statistics panels are for getting information, Transactions one is for inputing data. 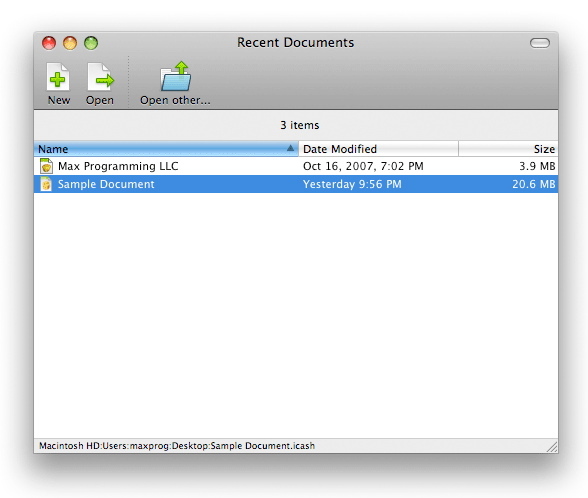 Documents open showing the Overview panel by default.